You May Like This: Outsider Y.P. 01. He’s been a regular feature of these posts, and for good reason: the Cork-based artist formerly known as Young Phantom continues to set out his stall. 02. After throwing an album listening party at the Glucksman last weekend, Mark Mavambu announced his debut album “proper”, Alone/Insane/Alive would drop that night at midnight on Soundcloud and his website. 03. That LP is streaming above. A concept piece exploring isolation, masculinity and depression. 04. Due today on Spotify, Apple Music and the like if Soundcloud isn’t your bag. Expect live activity to follow. Thoughts: It’s one thing for an artist to outline their ambitions as much as Mavambu has, and quite another to see that passion and grandeur being realised. Posted in Music, You May Like This and tagged Cork, hip hop, Ireland, new Irish music, new music, Outsider Y.P., Young Phantom at 10:21 am on May 5, 2017 by Broadsheet. 01. 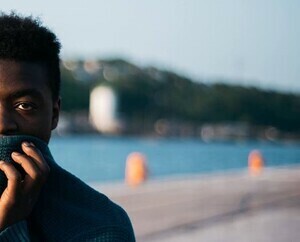 Cork-based rapper/beatmaker/freelancer Mark Mavambu has always been an ambitious sort, and the extent of what he has in mind is starting to make itself apparent. 02. Having both joined the ranks of the Word Up Collective (Dublin) and established Outsiders Entertainment as a catch-all banner for the exploits of himself and collaborators, the former Young Phantom has taken up the A$AP Mob naming convention to get the ball rolling on the latter, rebranding as Outsider Y.P. The music video is shot in the city of Hong Kong, starring fashion designer and model Sai Wing. The video is shot and edited by 3JBK, a team of videographers and video producers based in Hong Kong. The collaborative effort was scripted and co-directed by Outsider YP and 3JBK’s Edward Chun. This is the first of a possible many other collaborations between Yp and Asian based creatives. His love of anime and Asian pop culture in general was one of the driving forces behind Yp deciding to attempt to shoot his first music video in Asia. 04. The album launches on April 29th with a special listening party at the Glucksman Museum in UCC, with what’s described as an “unorthodox” listening experience, performance and an ambient DJ set from veteran Leeside beatslinger Stevie G.
Thoughts: This column has sung his praises before, but it bears repeating – Young Phantom is one of the most exciting artists in Irish music of any genre today. Posted in Music, You May Like This and tagged alternative, ambient, hip hop, Ireland, Mark Mavambu, new Irish music, new music, Outsider Y.P., Young Phantom at 9:50 am on March 31, 2017 by Broadsheet.